It's time for our monthly challenge at STAMPlorations, and this month we want you to use stamps and die cuts. I've used a leaf die cut from Simon Says as a backdrop to my rambling roses. 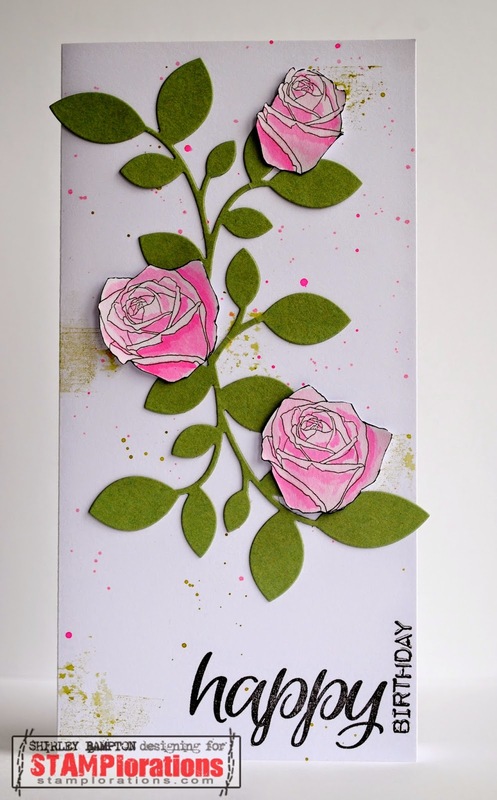 The rose image is from the Boxed Blooms and Bold Sentiments set. I stamped the image three times (ok, six times in case I messed up) then coloured the rose petals and cut out. For the rosebud I just cut off some of the outer petals. Then out came the paintbrush for a bit of splattering. The green grungy marks were made by spritzing one of the images from Vignette: Live Love Laugh with Peeled Paint and partially stamping it. The sentiment is Sentiment Builders: Happy. Great fussy cutting there gf! So cool - again - those splotches and splatters are great! Such a pretty card! Those roses are stunning and I love the splattered background! These roses are gorgeous :) what a lovely design ! Your roses are so pretty, Shirley! I love how each one is so unique, and your design is really beautiful!